Iarrived at Presaddfed Estate on September 10th 1975. My arrival was the result of a series of quirks of fate over the previous several years, which is a story in itself. 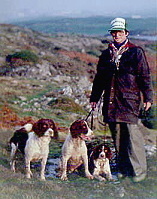 I got my first Spaniel about 10 years earlier when I was about 14 or 15. I wanted to take up shooting, but my mother was against having a gun in the house with five sons to shoot each other. I thought if I got a gundog first I could work on getting the gun later. I actually was thinking of getting a Labrador, but my mother decided a spaniel was more suitable for the house. I "trained" it by taking it to derelict farmland that was in walking distance of my home. The land had an abundance of pheasants, quail, and rabbits. For the next ten years I would often take my dogs to these places for training. When my original spaniel was a couple of years old I convinced my parents it would be a good idea to get a litter from her. We asked our vet for the name of someone with a Springer spaniel we could breed to. He gave us the name of a local man. This is how I first met Dr. Jack Riepenhoff. He had just won two National Amateur Championship titles with a dog named Gwibernant Gefni, a dog with the Erlandson prefix but sold to him by Talbot Radcliffe. Jack became a life long friend and was instrumental in developing my interest in the spaniel game and ultimately my arrival at Saighton's Kennels. Regular training sessions at Jack's Idle R farm were a great learning opportunity. Over the years I observed numerous handlers training even more numerous dogs of various abilities on both accounts. When I started going to trials pros like Elmore Chick, Cliff Wallace, Dave Lorenz, Clarence Wingate, and Don Brunn were all running several top class dogs at most trials. John Buoy, Dan Langhans, Chris and Janet Christensen, and Jack Riepenhoff were amongst the amateur handlers competing on equal terms with the pros with some outstanding dogs. Although the competitiveness of the amateur handler vs. the pro handler is commonplace now it was not always so. These people and others and their dogs showed me what was expected from top performing trial spaniels. John Isaacs moved into the Central Ohio area. He had recently retired from the Air Force and had bought a place to start up a kennels. He met many of the spaniel people while stationed in England. He had almost immediate amateur success with some dogs he brought back with him, and trained. Much to the surprise of many he soon declared himself professional. I quickly developed a friendship with John and spent many weekends at Guaidaira kennels helping John train his string of dogs, some he bred himself and some he imported from the U.K.